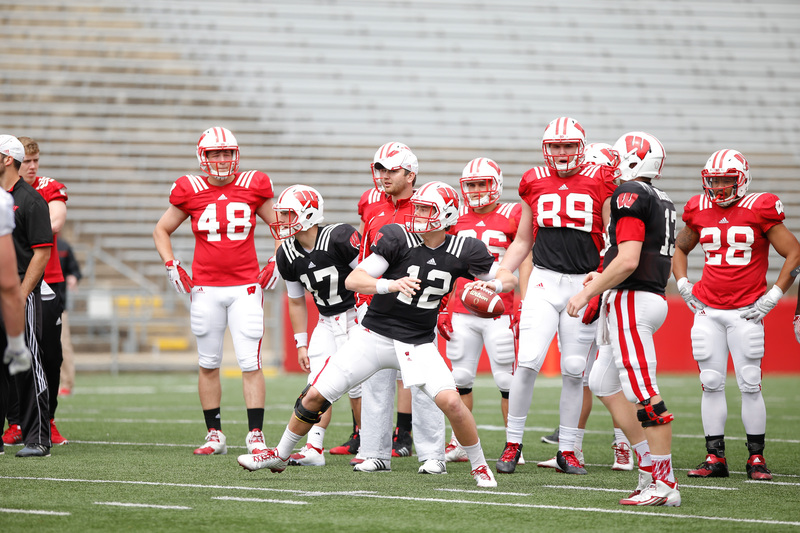 The University of Wisconsin football team held its annual spring game Saturday at Camp Randall stadium, capping off their short spring season. With summer workouts approaching and the start of the regular season just a few months away, the Badgers still have plenty of questions surrounding their personnel on both sides of the ball. The biggest question heading into the spring was figuring out who would replace Joel Stave as the man in charge of the Wisconsin offense. Although a starter won’t be named until well into fall camp, Alex Hornibrook capped off a strong finish to the spring period by outplaying Bart Houston Saturday. Hornibrook had two deep touchdown passes to George Rushing and commanded the pocket well. The only mistake he made was a costly underthrow in the red zone that should have been returned for a pick-six. With D’Cota Dixon out most of spring and Leo Musso unavailable for many practices, Arrington Farrar, Joe Ferguson and Evan Bondoc were able to make the most of their opportunity. Farrar is specifically an intriguing prospect — the former four-star player from Atlanta can patrol the backside and should grow into a major role during his second year on campus. Expect some combination of him, Dixon and Musso to start against LSU. Rob Wheelwright and Jazz Peavy are the clear one and two at the receiver position and developing depth behind the two upperclassmen has been a priority for the offensive coaching staff. Rushing made the biggest splash with two long touchdown passes from Hornibrook, but has struggled with consistency in his Badger career and had a bad drop late in the game. With Reggie Love sitting out the scrimmage, it will be interesting to see which of the freshmen step up when they arrive on campus in the fall. Keep an eye on A.J. Taylor, one of Wisconsin’s highest ranked recruits, to make an instant impact next season. After Derek Watt served as the lead blocker for the past few seasons, the Badgers will look to use a little more depth this season. With Alec Ingold and Leon Jacobs both switching to fullback in the spring, they will join Austin Ramesh in forming a formidable trio at the position. Wisconsin will have some options out of the backfield and Chryst also noted that due to limited depth at the tight end position, the fullbacks may need to chip in there as well. Every coaching staff’s goal during the spring game is to leave the event healthy, and the Badgers have prioritized this given the fact they don’t play an actual game. Other than reserve lineman Jason Erdmann leaving halfway through the scrimmage, the Badgers managed to avoid any major issues. Jacobs was hobbled during the practice portion of the day, but returned later in the session as the second-team fullback.